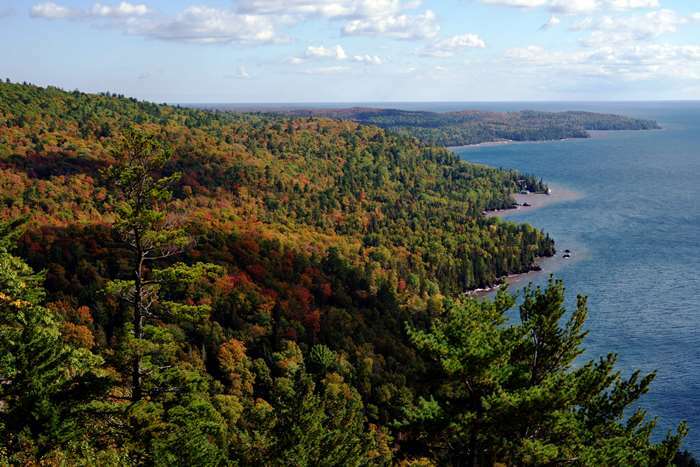 Michigan’s Upper Peninsula is a good place to go, in the search for fall colors. The U.P. 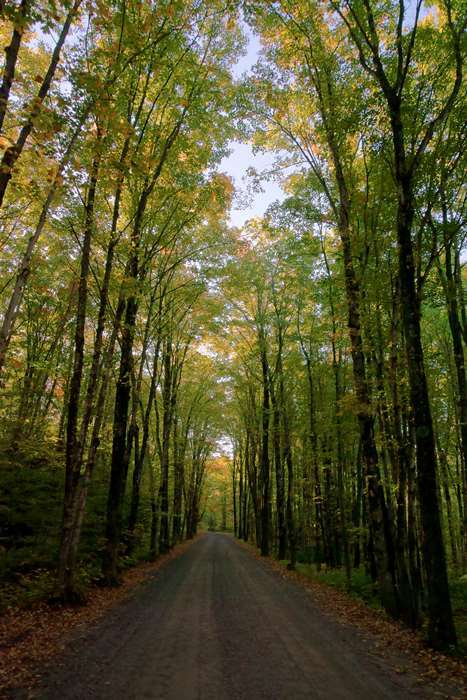 has miles and miles of hardwood forests which turn to brilliant colors in Autumn. In early October, 2017, I set out to find the best fall colors and some great places for Autumn hikes in the Upper Peninsula, and I’ll guide you through some of my favorites, and help you estimate the very best times to catch the very best fall leaves. You can easily access Michigan’s Upper Peninsula by flying into Minneapolis, Milwaukee, or Detroit, then driving north. The U.P. doesn’t have any big cities, but there are small cities and towns that provide plenty of lodging options. I focused my time in Marquette (roughly mid-way across the U.P.) and Houghton/Hancock (on the Keweenaw Peninsula — yes, a peninsula on the peninsula, that sticks out into Lake Superior). In 2017, I visited the Upper Peninsula during the first week of October. I stayed in Marquette on October 2 and 3, and in Hancock on October 4-6, and finally in Ironwood on October 7th. 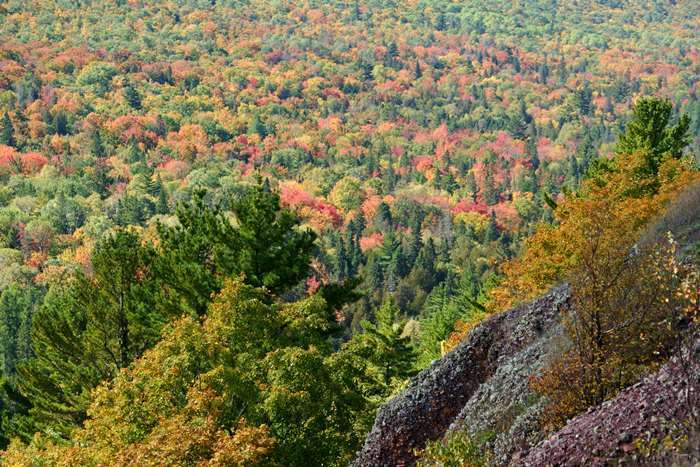 Peak fall color times will vary from year to year, but you probably already know that. The arrival of fall colors has a lot to do with whether the previous weeks have been wet or dry, cold or hot, and when the first frosts hit the area. Based on what I experienced in 2017, I’d suspect that the second or third week of October is the best time to see the fall colors in the Upper Peninsula. However, inland areas will peak before areas that are near the big lakes — Superior and Michigan. 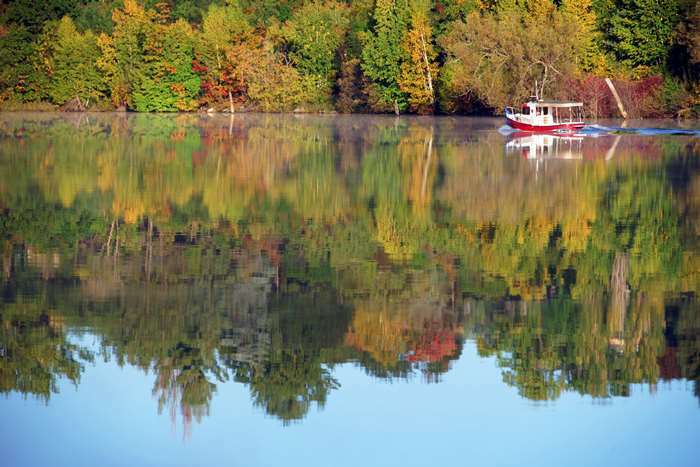 The warming effect of some smaller lakes could also delay the arrival of Autumn colors. If you arrive in the U.P. and everything is still green along the coast, head inland. Here’s a breakdown of a few of my favorite places. Follow the links to read much more about each location. You can also take the entire trip, starting here. 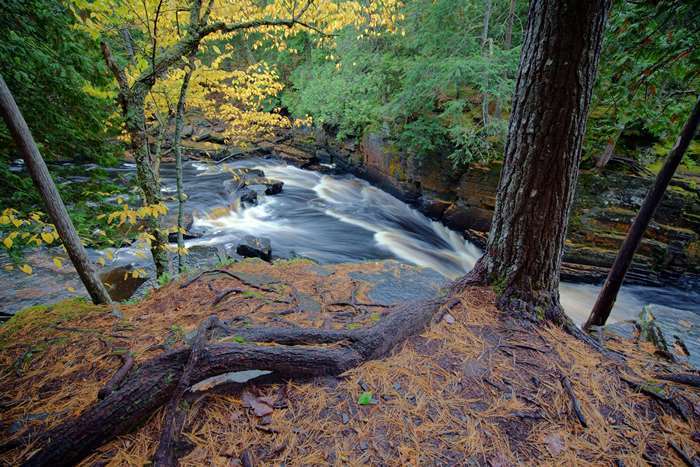 The Porcupine Mountains are located at the far western end of the Upper Peninsula. I found very good fall colors, probably near the peak, on the Summit Peak Trail in the middle of the park. The most popular trail in the park, the Escarpment Trail over Lake of the Clouds, was not showing nearly the fall colors that I found at Summit Peak, just a few miles away. This is probably because it’s close to that small lake, as well as Lake Superior on the other side of the escarpment. Color probably didn’t peak here until the second half of October. A peninsula that sticks out into the middle of a lake is not necessarily a good place to find early fall colors, but I did find some excellent reds and oranges on the road to Gay, Michigan. Up the road a bit, towards Lac La Belle, Haven Falls is a beautiful place to stop, any time of year. It’s even better at the peak of autumn colors, which probably occurred about a week after my visit to the area. 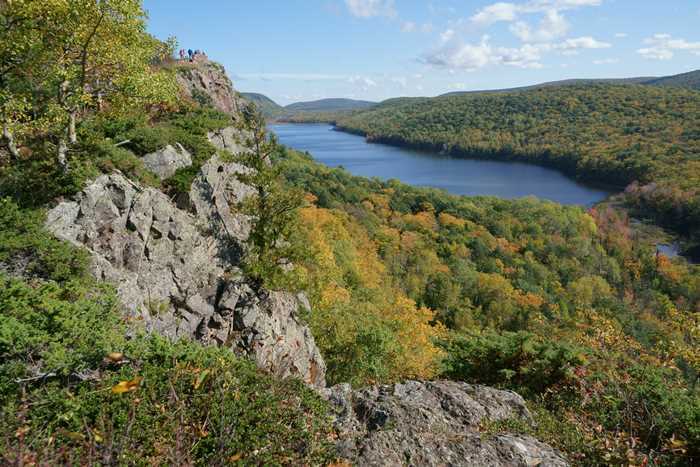 The Bare Bluff Trail in the Grinnell Sanctuary near Lac La Belle was showing some fall colors during the first week of October. There’s a lot of water nearby, so I’m guessing the fall colors were delayed here until the middle of October — although there were some spots where the trees were looking very good. 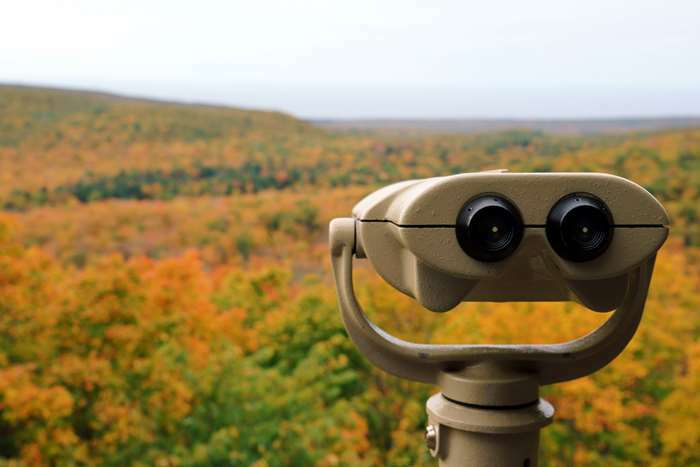 Brockway Mountain Drive should be one of the best places on the Keweenaw Peninsula to spot some great fall colors, but I was at least a week too early. Most trees were still green, with some yellows starting to break through, during the first week of October. 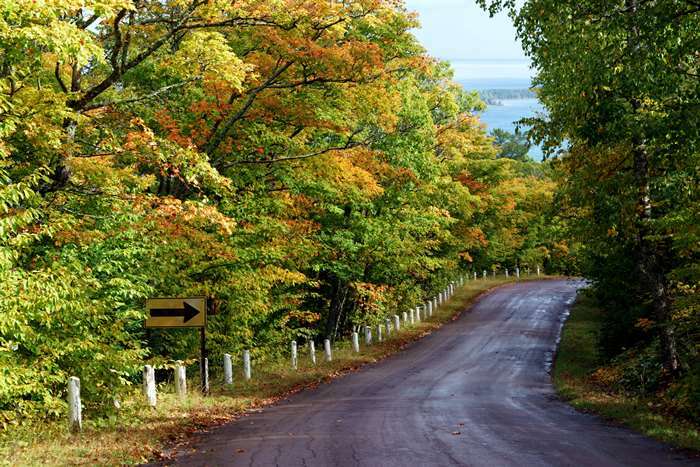 Brockway Mountain Drive follows a ridge that overlooks Lake Superior. Looking away from the lake into the dense forest to the south, some reds were also beginning to show, but there were still plenty of greens, as well. 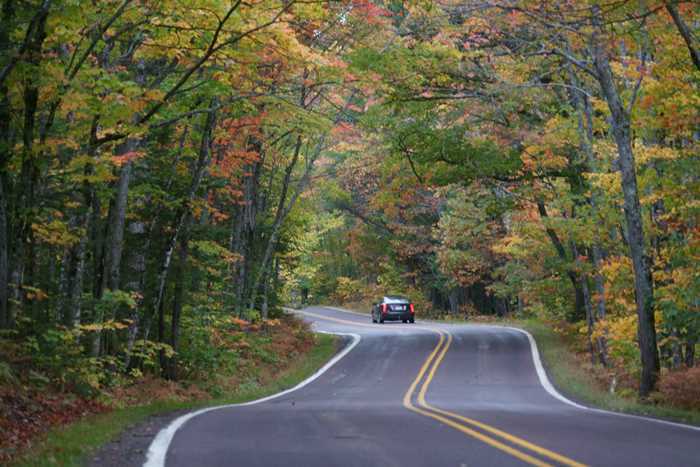 The colors were just starting to get good along US 41, just a few miles south of Copper Harbor. This portion of US 41 is a “covered road” — essentially a tree tunnel. Also, you can try taking some side roads off of 41 (like Wyoming Road, pictured at the top of the page) to find even more fall colors. 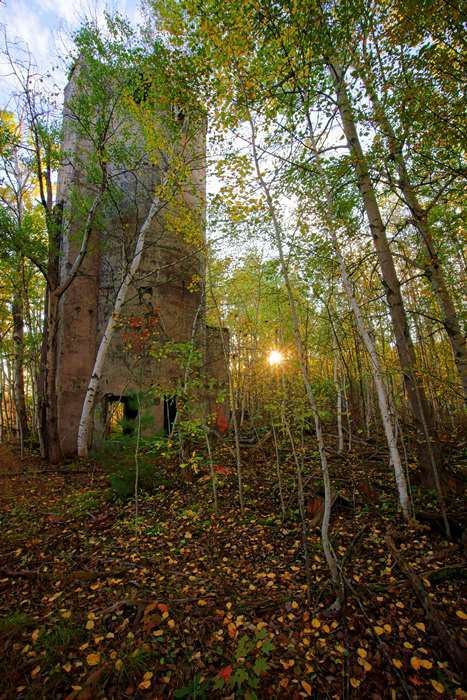 The Quincy Mill, and Dredge #2, are not to be missed when visiting the Keweenaw Peninsula. 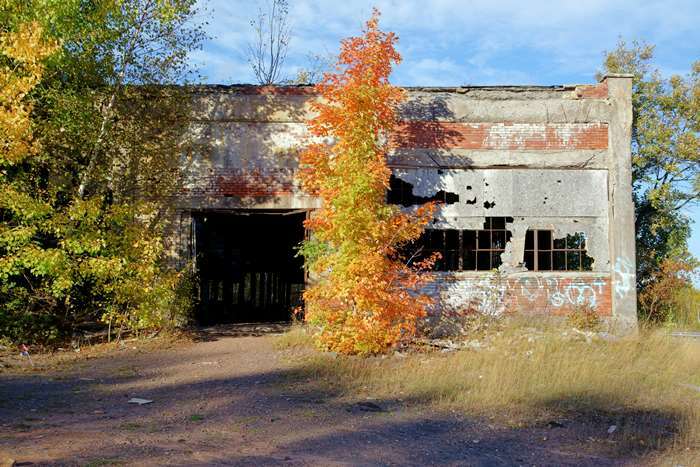 There were some pretty good fall colors surrounding the decaying old building, right at the edge of M-26, during my visit. Across the street, the old smokestack, coal silo, and other ruins are surrounded by a patch of trees that were just turning yellow during my visit. The late-day sun filtered through those yellow leaves to give everything a soothing hue. The colors were looking pretty good, in the reflection on Portage Lake (the Keweenaw Waterway), early on the morning that I left Hancock. By mid-October, they probably would have been even better. Just outside of Hancock/Houghton to the west, you’ll want to drive down the Covered Road to Freda, Michigan. The “covered road” effect is even better here, than it is on US 41 to the north, because it’s a narrow dirt road that’s entirely swallowed up by trees. On my visit, there were a lot of yellow leaves, casting a beautiful light on the road, but there was still plenty of green, too. 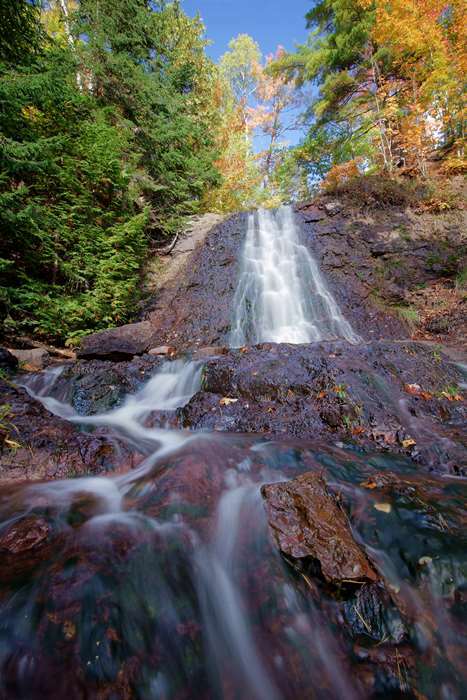 South of the Keweenaw Peninsula, and west of Marquette, you’ll certainly want to take a hike down to Canyon Falls. It’s a series of waterfalls that plunge through a narrow canyon, not far from an unassuming roadside picnic area along US 41. Only a few trees were turning here when I visited, but if that bright yellow tree is any indicator, the colors will be splended here at the peak! 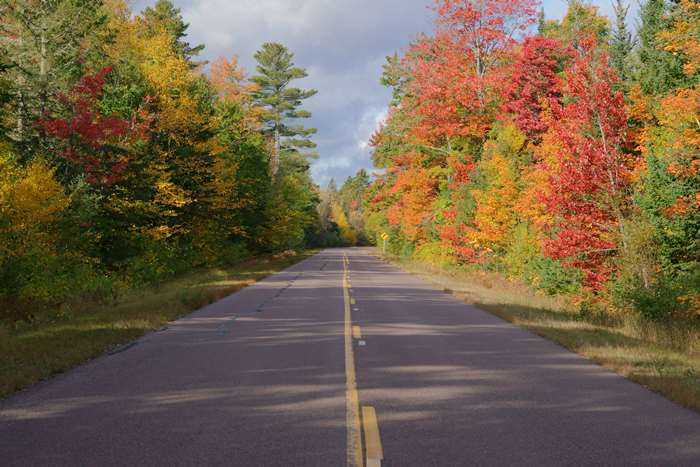 I’ve read positive things about the fall colors on several roads near Marquette (including M-35, south of the city, and Route 550 to the north), but the colors weren’t very impressive on these routes when I visited. They might be much better by mid-to-late October. If you have some favorites, please let me (and everyone else) know by leaving a comment below!